Whether you are writing your own free game or looking to spice up the game you're running, free images always come in handy. I'm forever moaning about free RPGs not having quite enough images in them, so here's the help you need. I was inspired to put this together by Zach's post on the The RPG Site. Many thanks to those that contributed there. Before I get into the linkorama it's worth noting that you should be careful what licenses are attached to the different images. If you are producing something for sale, may I recommend you pop over and throw some fabric at a proper artist. 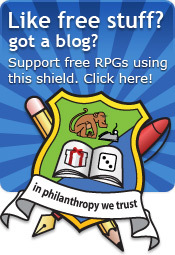 Most places would like a link back, which is no real hardship for any free RPG, right? Artclipart.com. Have a big selection, most cartoon like but some more realistic ones too. The list is categorised into Castles, Dragons, Elves, Fairies, Fairy Tales, Medieval, Pirates, Unicorns and Wizards. Karen's Whimsy has a great selection of public domain images like the plates you might find in historical books. 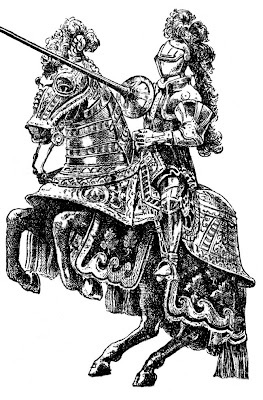 Medieval Woodcuts Clipart Collection is a fine collection of authentic (well they look authentic to me) black and white images CC where the owner would like a link back. WP Clip Art has a large, categorised collection of all sorts of images. I'd recommend the Fictional Characters and World History categories. Open Clip Art has a huge number of items. Might be a bit difficult to find what you need as they are grouped together in packs but the quality of those I randomly picked is high. Zorger.com is a great search tool for loads of CC images, many of them historical. Very cool. Abyssal Maw's CC images he posted up on the RPG Site. Nice! From old books has a load of scans from really old books. Obviously, this throws up lots of historical images. Well worth a look. 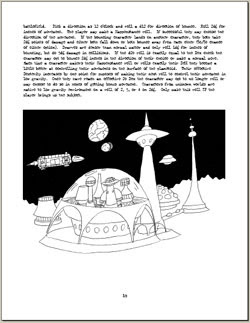 Incredible Clip Art Images is an aptly named list of clip art sites. DMOZ Clip art list. DMOZ is the free open directory and there are easy-to-browse categories. Medieval and Renaissance seems like the most appropriate. Jupiter images has a list of other royalty free image sites. Be warned! Inbetween the free stuff is paid-for-stuff too. 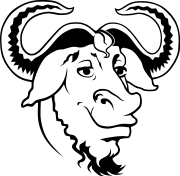 If you're looking for a great tool for shaping these images for your own use, I can heartily recommend GIMP, which has radically improved in recent years to punch as hard as Photoshop. Of course, if you are aware of any free (public domain or Creative Commons) images that might be relevant for your RPG, please pop the link in a comment! 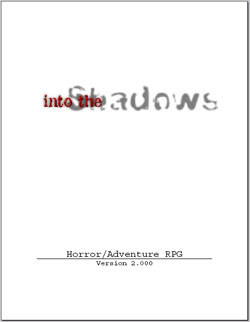 Into the Shadows is a complete horror roleplaying game by Craig Griswold. 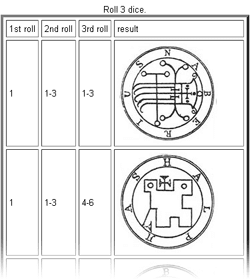 The mechanics are based on West End Games' D6 system (like in the original Star Wars system) and setting inspired by H. P. Lovecraft (although not solely so). It's a modern take on horror with cars, guns, psionics and magic. A place where elephants go toe to toe with off road jeeps. It's got its ragged edges but between them is a real gem. Characters are constructed from the typical mix of descriptive sections, attributes, and secondary attributes (although no called as such). The attributes in Physique, Reflex, Canny (Intelligence), Education, Technical and Will[power]. What I will refer to as secondary attributes include move rate; whether the character is magic or psyonic sensitive; Karma, Survival and Life points; special advantages and disadvantages and equipment and weaponry. If that sounds like rather a lot, you're right. 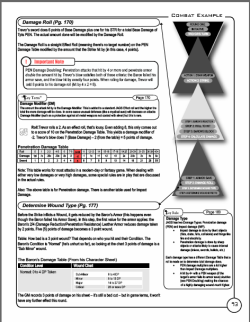 However, not all are required during play so the character sheet is not overburdened. A player can choose to begin with the pre-built selections of stats or build from scratch, where you assign the stats yourself. The choice allows both quick character creation and stat wrangling, a very nice touch I've written down for the next version of Icar. Karma points allow temporary ability boost for those dramatic moments, rewarding flamboyance. Survival points work like XP, plough them back into your character. There are no levels although skills become more difficult to raise the higher they are. Starting characters have 18 dice (which are D6) to share between attributes, special abilities, psionics and to learn magic. Simply, you can assign dice to a given attribute, the more dice you have on the attribute, the better you'll be at it. You're going to roll these dice, add them up to beat a target number, so the more you have, the more likely that will be. You can also split a single dice between lots of attributes by splitting a dice into 'pips'. A dice can be converted into three pips. A pips gives you +1 to an attribute. The upshot is that if you assign 3 dice and a pip, you would end up with 3D+1. You can receive more dice for taking disadvantages and burn more on special abilities. There isn't a big list of these but guidance on how to set them (which is enough). Psionics, Magic and Priest powers are bought in the same way. You then take 7 dice to spread between skills. This is well explained with some good illustrative examples. This system allows you to specialise in a big way or spread yourself thin. It gives the players more than enough rope to hang themselves. Skill, Magical, Psionic and Priest abilities are chosen from large, well described lists. Skills are derived from various attributes. For example, the skill Gymnastics is derived from the Reflex attribute. The skills are not well balanced betwen the different attributes: Physique has 4 skills, Dexterity has 20. Balance is achieved later in combat as Physique can be used to avoid damage. Skill specialisations can be purchased to denote particular talents. 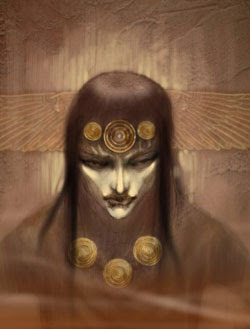 The skill list is comprehensive and I think just about any modern world task can be found amongst them with a leaning towards the setting with skills such as Parapsychology and Mythos. The spells also have a good modern-horror taint, which echoes the setting nicely. Craig could have gone down the fantasy route but didn't. Nice one. Psyonic attributes are dealt with in a similar manner. Language is all important here and Craig has struck the right balance, giving you something of a feel for the setting through the description of the mechanics. A difficult thing to achieve. Task resolution is performed by rolling the dice next to the skill and adding any 'pip' plusses to the result. 3D6+2 means to roll three D6 and then add 2 to their sum. Try to beat a difficulty number with bonuses. One of the dice needs to be a different colour and is specified as a the Wild Die (which as a phrase in isolation sounds like the best way to shuffle off the mortal coil). Rolling 6 will add that value and then roll again. If you keep rolling 6, keep adding! This can turn marginal passes into landslide victories that could work interesting results into the narrative. Rolling a 1 either gives a penalty roll or a complication. A complication is a narrative hook, decided by the GM. A delightful opportunity for filthy evil GMs to get filthy and evil. Karma points are declared at the start of the round and double the values of the attributes. You can only save up to 5 Karma points, so they need to used wisely. Combat is performed by rolling against combat skills to hit, defensive skills to avoid. When damage is taken, you lose Life points and when they run out you're dead. Movement and vehicle combat is dealt with a similar system but there are more rules to digest. 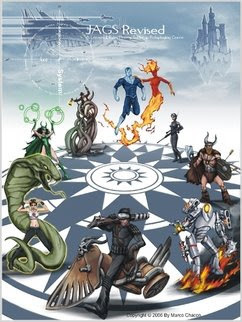 The given setting is with a invented modern day Bureau of Paranormal investigation, the characters playing new recruits. Assigned to a specific geographic area, the green field agents will travel around and investigate and solve. A considerable amount of background is available, including more equipment and vehicles specific to the Bureau. At this point, it seems like Craig shares my fetish for endless equipment lists! 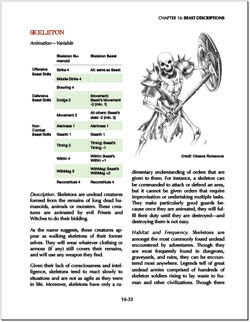 The bestiary is included in the campaign setting and includes everything from bridge troll to werewolf. Although there is enough description to get the creative juices flowing, I'd like to see more of an example adventure or two. There is a tonne of resource but the glue to bring them together for the new GM is missing. Go here, investigate this, find that, go mad etc. The main book includes mounts (horses, elephants), humorously named vehicles that are recognisable, a huge array of weapons and equipment. Much of it doesn't have a description but I think that's ok. Little quotes adorn chapter starts and other areas of the book. All the examples are clearly labelled although some do demonstrate how complex the system can get when you're doing vehicle combat. A fully featured GM section is included, with some good advice and some slightly authoritarian ideals. That aside, it's by the most fully featured free GM guide I've seen yet and fits well with the slightly old-school feel the D6 system gives. 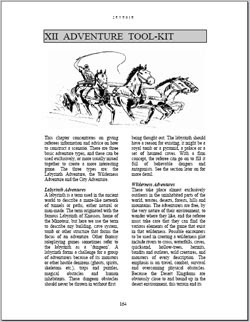 What's more on the website there is also a bespoke GM guide (not reviewed here)and a series of adventures, each packaged in their own PDF. 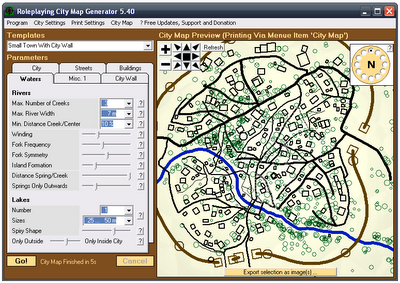 The current version is 8 years old. The last website update is 5 years ago. Impressive those statistics might be, I can only hope that a few tweaks might be made for the next version. The book is mostly single-column, making some line lengths too long for comfort, it is bereft of pictures which is a shame. 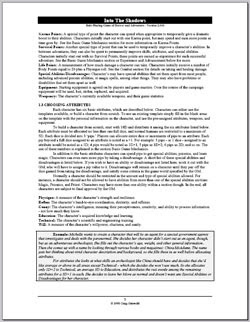 As some of the sections are very text heavy, a few images would lighten the load. 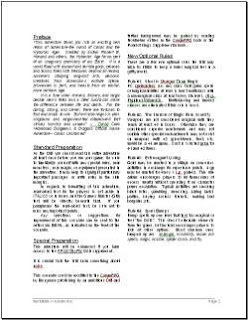 There are a few spelling and grammatical mistakes and although there are page numbers in the main contents page, the quick skill lists could use page numbers too. At some points rules are referred to without being explained. A little reference would help there. Finally, the setting is planted firmly in the GM section. I prefer any setting to have a player and a GM section. It's much easier to sell a game to a group of players if you can get them to read some publically available information. 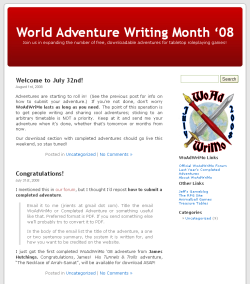 Perhaps some of the adventures on the website might be congealed into a single adventure to add into the book. I can only pray that Craig might read this and be inspired to revisit Into the Shadows. Not to paint the rules with a storyteller brush or add narrative control but to refine, expand and polish his creation. The D6 rules hold up well and the sheer weight of resources is impressive. It has that feel of something that really has been played. 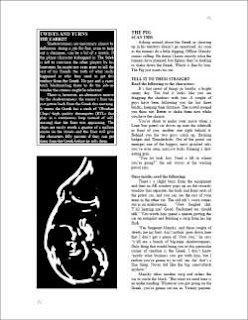 Into the Shadows is ideal for someone looking for system to throw a Lovecraftian setting idea at. 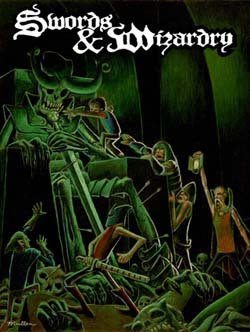 Swords and Wizardry by Matthew J Finch does exactly what it says on the tin. A gold tin forged in the fires of Mount Doom, to be one day lobbed back in by a scrawny bipolar neurotic. 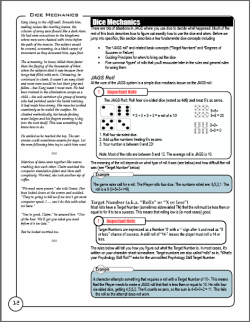 It's a boiled down core rules takes from the open-sourced version of the zeroth edition of Dungeons and Dragons. So old school that Latin is its first language. It stands proud for what it is. Unashamed to be derived from the earliest incarnation of the hobby that has commanded so many hours of our lives. It makes no apology. Roll up. Gear up. Get stuck in. It might be worth mentioning that I've never really played Dungeons and Dragons. 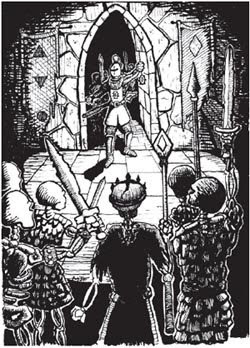 I've dabbled at conventions under the watchful gaze of very understanding RPGA gamesmasters but for a legend such as Dungeons and Dragons, you really need to campaign it. Something I've never done. My myopia stretches just to the degree that I am aware that there are lots of editions and regular verbal fights erupt across the digital landscape regarding love, betrayal and murder but I'm not got a monkey's chance of understanding it. If you read this thinking 'DUH! MUPPET! 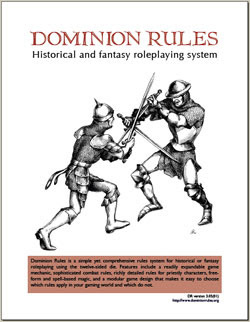 ', assume that I've never read a mainstream roleplaying game before. And you'd be right. This might all sound very familiar to you but for me, it's something of a revelation. Imagine having toiled over physics studied to discover, years later, Newton's three laws of motion. If you're as fantasy ignorant as I, its like discovering the Rosetta stone and realising all these funny stick men hieroglyphics you've been staring at for years actually mean something. You rolls D6 for a series of Abilities (Strength, Dexterity, Constitution and Intelligence) and the value you roll translates to a plus or minus modifier. Once you have your Abilities and modifiers nailed down, it's off to choose your character class, which determines what sort of things you can do in the game. The classes are Cleric (a god botherer who prefers bashing people's skulls in with blunt instruments and throwing Deus driven magic, unlike my local vicar), The Fighting Man (who enjoys an evening in with Tennyson and cup of cocoa, obviously) and The Magic User (pointy hat, spell book, women's clothing). The Class gives you choice of equipment and skills but also a an advancement table, which plots how much experience you need for each level. After that, you choose a race: Dwarf, Elf, Halfling and Human. Then blow your hard rolled gold on loading up on stuff (20 foot of rope buyers are welcome). Finally, you calculate your Armour Class, which can either be either ascending or descending variants depending on what makes sense to you. Armour Class determines how hard you are to hit. You kill stuff. You gain experience points. You go up levels. You get better. Kill bigger stuff. Repeat. When you want to hit something, roll a D20 and then check the ENORMOUS table! I'm not so keen on tables. Turn action runs in order: see if there is a surprise attack, spell chuckers get to say what they're chucking, work out who goes first and then get stuck in. There's some advice on avoiding combat by lying and cheating. If players around the world are anything like mine then lying and cheating in character comes almost as easy as starting combat. So that's 23 of the 82 pages sorted. Roll up! Roll up! Massive spells lists for you to peruse. More tables. More lists. Rule-ettes and a multitude of dice to wield. I know many people salivate at the thought of pouring over 30 pages of spellitude so I'll take a brief pause for those to collect themselves. Of course, this is a delightful hypocrisy coming from a man obsessed with pages of guns and phallic space craft. The game master section is a nod to game master sections. Blink and you'll miss it before ploughing into Monsters! Loads and loads of monsters. There's an entire ecosystem. From dragons to mould. Yes, mould. For those who have never played fantasy before, this might come as a shock. Mould. Yellow mould. A guide to making your own is also included. 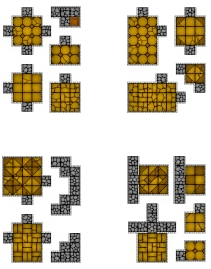 A brief guide to setting the right level of challenge is given before ploughing onto Treasure! Tables galore. Then some magical items. The book itself is 82 page PDF and is well laid with a profusion of tables images early on. It's laid out for duplex printing, so print the odd pages first. The text is curt and in plain English. It doesn't assume you know anything about Dungeons and Dragons, so complete mongs like myself have no difficulty digesting it. At 82 pages, it's quite heavy but there's no wasted space. It's currently on Lulu as a free PDF and you can even buy it there too! Smashing! Joyously, Swords and Wizardry is new. Odd that might seem but the publish date is 2008. There is a forum that appears to have a reasonable amount of activity for a single game. It's heart warming that a niche old-school game has its own community with enthusiastic types chatting about all aspects of the game. Worth a look. Changing, modernising, and de-table-ifying Swords and Wizardry would ruin it. It has to be old school. It's very aim is to give a glimpse into the past, a time capsule of roleplaying. It's a little too light on images, especially in the monster bit. Mould. Need pictures of mould. I think it's also a shame there there isn't a setting here. It's crying out for a Tolkeinesque affair with Orcs, a dark Lord, hoity-toity Vulcans Elves and tiny people with the fate of the the world in their hands. Would it be an enormous ball ache to produce such a thing? A go on, Matthew, you know you want to. Hurrah for old school gaming. Hurrah for tables for everything. Hurrah for Matthew and the respectful dedication to Gygax. Swords and Wizardry is basic but it works. You get that solid feeling from Swords and Wizardry, the difference between a 70s VW camper van where linkages connect the steering wheel to the wheels and a modern Toyota where elastic trickery and magic does the work. It's not overburdened with rules but each Spell pulls rules in through the back door in the form of tables. Bar that, it's a nice solid base for anyone wanting to build their own setting. Or plunder Tolkein like everyone else. Dig out the old polyhedrals from the bottom of your underpants drawer and get stuck in to gaming the way they did before Star Wars existed. WOAH THERE! Hold on, adventurer! 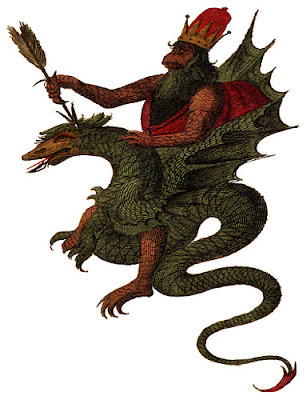 The Legendary Dariel expanded Lost in Smaragdis into the Gods of Gondwane. So I Reviewed that too. Check that one out instead, it's like this but much, much better! Lost in Smaragdis by Dariel R. Quiogue is a roleplaying game set in a parallel world where the Lost World meets a smorgasbord of historical eras. 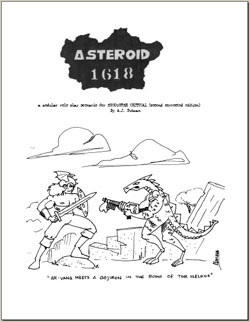 The core gem of Lost in Smaragdis is (unsurprisingly) Smaragdis, a parallel world filled with Dinosaurs, Conquistador, huge flying machines, Pirates, the remnants of an ancient civilisation and just about any other interesting part of history you can shoe horn into a single document. Reading that aloud sounds like a terrible mess but the setting is glued together solidly. I hope I manage to get that across in the rest of the review. If I don't, please berate me in the comments. Character creation stomps along the much beaten path: The GM sets the scene, players come up with a concept, decide on abilities, traits, hooks (non-mechanical facets) and so on. 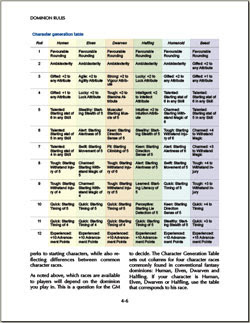 A character is defined by a Main Ability (3 dice), which is a single thing that character is best at; Major Abilities (2 dice), which are those things that the character is really good at; Minor abilities (1 dice) are those things that the character can do but aren't really a speciality. As you can see, facets of the character are based around the number of dice, more on this later. Traits are like abilities but they are those things that make you better than other people. I like this mechanic because it augments the abilities. For example, you might choose to have Athletics as an ability but then 'Greased Bloody Lightening' as a trait. You can have up to 3 traits, assigning a number of dice up to each (more later). Hooks are those character quirks and oddities that you might choose to make the character more interesting, such as warts, impatience and so on. They can be physical or mental but do not have a mechanic. Each human character gets 4 health points. Simple as that. Equipment and clothing is then decided before the GM making the final finished adjustments. There is a great onus on the player and GM to come up with the abilities, traits and so on. There are no large lists of skills and the like. 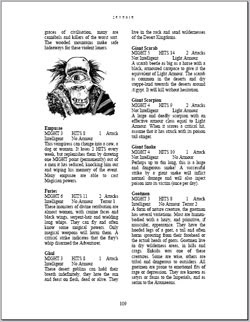 Some may prefer this rules light method, experienced players brimming with imaginative insight will rustle up a character in a thrice. Is light. A near-zero calorie affair. Your roleplay dietician might recommend you take on extra gaming protein while playing this game else you might become malnourished. If you're a fast and loose personality, this system will be right up your alleyway. Every ability, trait and so on is measured by a number of D20 dice. You declare you action in cinematic sort of manner: 'I spring up out of the bush and dive to leap onto the back of the T-Rex'. By adding that colour, the GM might award some bonus dice, a reward for adding more spirit into the game. It's also recommended that the GM might ask the players how many dice that deserves. A story-telling aspect but not so huge that it might take over. You roll the number of dice from the most appropriate ability (such as Athletics) and try and beat a target number of any of those dice. The more dice you have, the more likely it will be. Neat. You get to add trait dice too but you can only use them up to the number you assigned. Assign two dice to 'Greased Bloody Lightening' and you get to use it twice that session. A critical is when you roll the same as the target number. The target number is decided by the GM on a best guess but it is recommended that the faster the pace of the action (and thus the faster the thinking of the players), the lower this target should be. I rather like that. Combat and conflict is performed by escalation. The instigator of the conflict declares the action and the GM sets a ceiling for the opening bid. The instigator 'bids' a target number for it. The opponent then describes a counter action and the target number changes. This goes back and forth until either of those in the conflict elects to roll. The aim here is to get a face paced back and forth of description. The person who elects is likely to be thinking [sarcasm]'Yeah, right, I am sure you are going to be able to do that'[/sarcasm] or run out of ideas. For those interested in a fast narrative and less in the physical tactics of the game, this appears to be a brilliant system. The roll-off is used to determine who gets to narrate the end of the sequence. Damage is simply handled by incapacitating the loser. Smaragdis is a delightful setting. Campaign start would revolve around an inland sea called the Emerald Sea basin. Frankly, there is enough here to run an entire campaign and serves as a good example as to what Dariel is trying to achieve. Wildlife own most of it: dinosaurs and giant insects live amongst smaller more recognisable animals. Around the edge of the inland sea are a number of kingdoms, one based on the Spanish Conquistadors, one on French and English privateers (Pirates, really). Others included escaped South American slaves, a race based on the Punic people and Ancient Egyptians too. As if this wasn't enough, there is an ominous background Ancient Civilisation that left a hugely complex alien machine called the Core, capable of performing acts of 'magic' (although there is no magic per se). To use the machine, sorcerers get hold of Mind Gems and are activated to take control of a number of creatures, speak telepathically or use a range of different functions available from The Core. It's a fascinating idea that I can see working really well, a magical-like system with limits. One huge benefit of Smaragdis is that to get there, you need to go through a portal. These portals could be from and time and place, which means that you can set your campaign's characters from any period of history (or the future, naturally). It felt that the best choice would be 1930s adventure pulp, Indiana Jones and the like. Smaragdis has all of the elements you might expect from a modern RPG. The book is well laid out 19 pages but the fonts are rather uninspiring. A quick look on 1001 Free Fonts would soon throw up some more exciting type faces. The level of language is high although I think the use of obscure dinosaur names in descriptions is a little jarring. One example involves putting pistols into the mouth of a Mosasaur. I had Google at hand, so it wasn't a problem but if I was reading the book printed, a better mental image may have been constructed using more familiar dinosaurs. The full-steam clash of different times and places, I think Smaragdis would benefit greatly from pictures. Especially in the case of a map of the Emerald Sea. The description is good but a map would really help place the proximity of different cultures. I would revisit Smaragdis and flesh it out further: hunt down some freebie graphic, add an example adventure, expand on the descriptions of different cultures, build simple equipment lists and grow the list of things The Core can perform. Perhaps governing the weather or other aspects of nature might be fun. Lost in Smaragdis is more a fabulous idea fleshed out into a sumptuous meal rather than a complete game. Even the most unimaginative dullard would have difficulty failing to envisage a campaign based around the Emerald Sea. However, the system leaves a lot to the players and GM, which is fine for those blessed with unstoppable imaginations but for the rest of us shoe-horning a little gaming in after a brain sapping day at work, a little prodding in the form of skill lists named in the spirit of the setting would do wonders. If you're looking for a good campaign setting, then Smaragdis will go a long way to solving that. If you like light rule systems, then they don't get much lighter. If you want something deep to sink your teeth into, then head elsewhere. 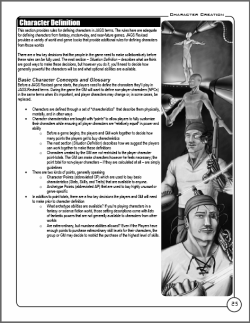 Dariel has scribed a triumph of an idea in a brief PDF and it may all many GMs need to set up a thrilling campaign, full of daring do and buckled swash. We can only hope that he returns to his pulp creation to plump, polish and perfect. If you ask really nicely for something, and I mean really nicely... with flowers and maybe chocolate... you get what you want. No, I didn't manage to copulate with Dariel, I got better. He expanded Lost in Smaragdis to create Gods of Gondwane. What a splendid fellow.